There are currently 130 people online. 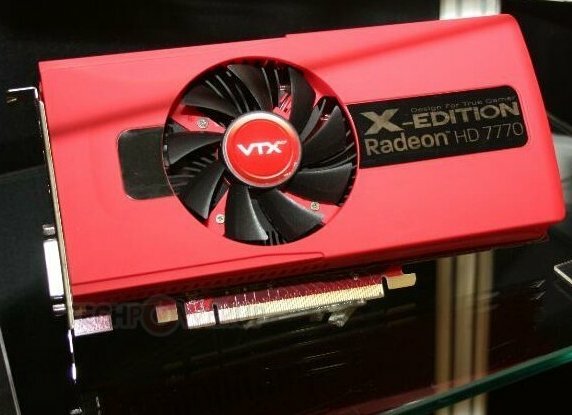 TPU reports TUL's VTX3D brand is showing off the Radeon HD 7770 X-Edition at Computex. Thsi card features the reference cooler (with different colors though) but factory overclocked clockspeeds; it has a 1150MHz core and 1GB GDDR5 memory clocked at 5000MHz. The factory-overclocked graphics card comes with clock speeds of 1150 MHz core and 1250 MHz (5.00 GHz effective) memory, against reference clock speeds of 1000 MHz core and 1125 (4.50 GHz effective) memory. The card features a red-colored AMD reference design PCB, and a cooling solution that's just cosmetically different from AMD reference design (red and black colors inverted). The card packs 1 GB of GDDR5 memory across a 128-bit wide memory interface.